I like to think if you blinded folded me and lead me gently to the center of my garden on any given day of the year, and then took off the blindfold, I could look around and tell you about what time of year it was, give or take a week or two. 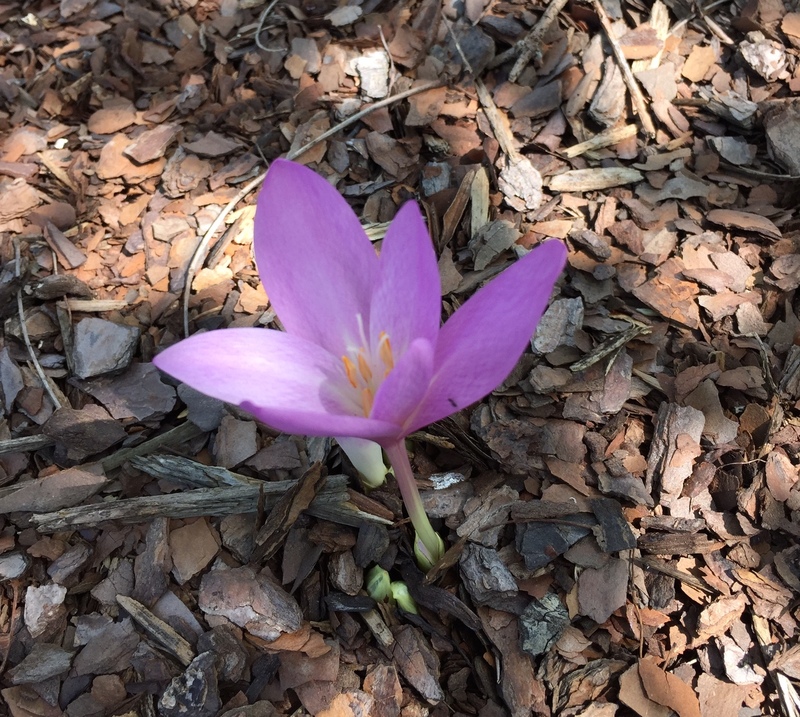 Today, I'd be off by a few weeks because this autumn crocus is blooming and I think it's early. I usually look for the autumn crocus, Crocus speciosus, around mid-September. It could be because after record amounts of rainfall in July, it is now quite dry in the garden and so this flower thought it had better bloom now before it dries up. It could be blooming now because we are going to have an early frost and a wicked cold winter, and this bloom wanted to flower, or this flower wanted to bloom, take your pick, before any frost showed up. It could be a trick being played on me by the garden fairies. They do stuff like that to me. All the time. In fact, now that I think about it, the toad lilies, which are usually quite late to bloom, started blooming several weeks ago. What do the toad lilies know? I'm on high alert now to watch and note when the rest of the fall bloomers, including Colchicum, Solidago, and Symphyotrichum, show up. Will they be early? Will they be on time? What is "on time", anyway? Does their bloom time tell us anything about the upcoming winter? Time will tell, as they say. In the meantime, enjoy each flower as it blooms, that's my new motto. And I'm enjoying autumn crocus in my garden. ***** Autumn crocus, Crocus speciosus, is as easy to grow as spring-blooming crocus. Purchase and plant corms in the fall. Leaves will sprout in the spring and then die off. Flowers will come out and bloom in early fall. Some say it will be a hard winter in the UK too, not looking forward to that. What a sweet little bloom. I would certainly enjoy this if I had one blooming in my garden too. I must talk to those garden fairies. Oh, let's hope it is just the Garden Fairies playing a trick on you! Autumn seems to have arrived early here (Mississippi), too. I am afraid it means Winter is coming early. No, no, please let it be just the Garden Fairies! I am not a fan of cold weather. I hope it holds off for a long time. My Crocus speciosus are much bluer and bloom much, much later--well after the colchicums. My colchicums, on the other hand, can often be as pink as your flower is, and some of mine are peeking out of the earth. Which leads me to ask: Are you sure that's not a colchicum? I just never know what to expect from the weather anymore, and I don't know if the seasons have gone crazy, or if I have not yet adjusted to Ohio weather after "only" living here for eleven years. So I'll try to just enjoy each flower as it blooms, as you suggested.